BrainFizz - Routing, Making, Custom projects & Training. 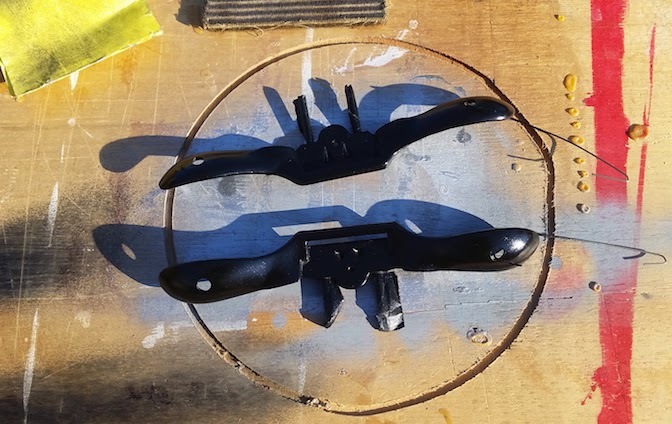 : Renovating Handtools, spokeshaves actually, but mainly because it keeps the rust off! 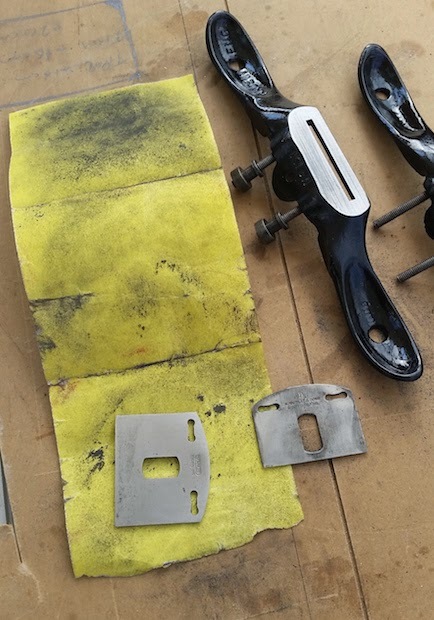 The first job was to take them apart and remove the surface rust. It was here I decided to paint them as well, hence the blue tap on the threaded rods - I couldn't un screw them without using mole grip and i didn't want to damage the treads. All the rust, which was only light surface rust was taken down with a combination of a wire brush and 12oG sand paper, they then got a coat of primer. The cap irons got the same treatment. in terms of de-rusting. I could have left it here and just oiled them up again, but since it was only a couple of months a go i did this, I didn't really want to revisit this job again. 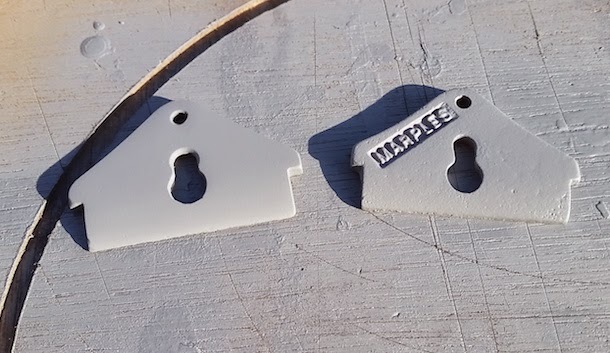 It was lucky I has a can of Primer around, I decided to do this with no prior planning, so Had I not had it I would have simply painted them with priming first. I think they got three coats of Gloss black paint - Car paint, nothing special. The wire is to hang the parts while drying between coats, i simply held them up in front of me to spray them and left them hanging to dry. When looking for the paint I discovered I had some clear lacquer too, so I gave them a couple of coats of that for good measure. 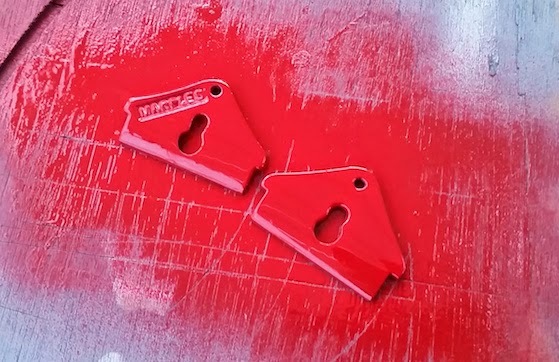 I'm actually pretty pleased with the results here, as I really am rubbish at spray painting, I normally put on far too much in one go and get lots of runs and drips, but I made a real effort to go easy, and the results were nice. 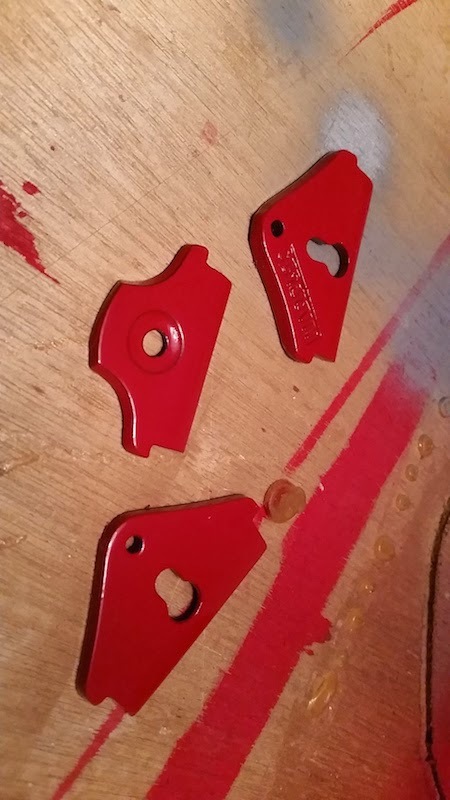 The red paint I had to source, because I only had gloss black and clear. Fortunately My friend who is the metal worker/model engineer keeps this kind of thing around in abundance, I had a choice of loads of colours, but price red. I really don't know why I picked red, I just wanted a driiferentw colour to black. But as it turned out, red and black are the usual colours from new. 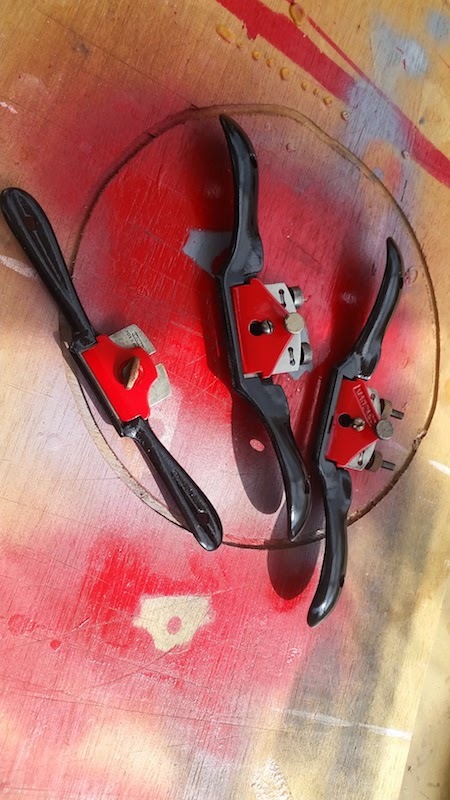 I guess had I taken any notice or thought about it, Id know that from the red paint left on one cap iron, and black from the bodies, but as I say, I didn't actually give it any real thought - honest! These also got a few coats of clear lacquer too. At this point I decided to do all three, the 2 with flat soles you've seen pictured already, and an older model with a convex sole, guess I might as well have a matching set?! 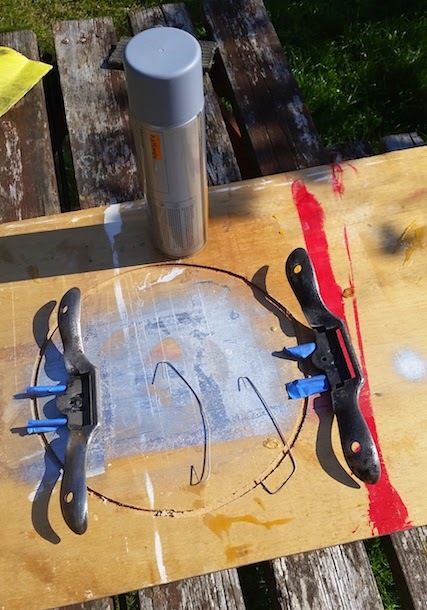 From there it was just a case of waiting over night for all the layers of paint an lacquer to dry before sanding off the paint from the mouth around the blades. 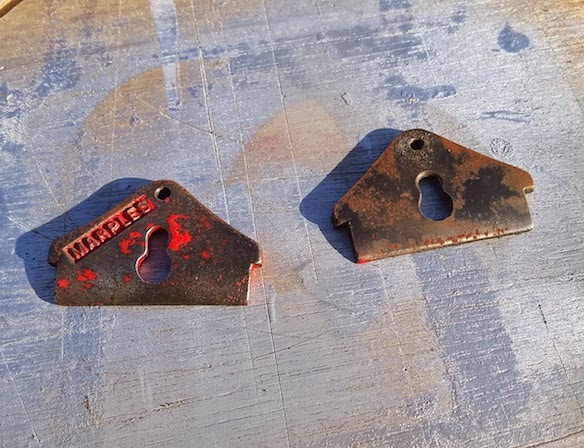 I also cleaned any surface rust rom the blades too. I though about clear coating them too, but didn't in the end. And here's the finished result. I'm pleased with the results, and surprised at just how easy it is. 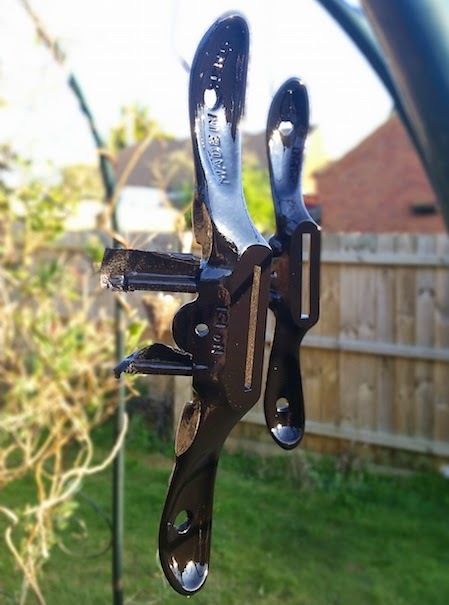 At least the hour or so I now have invested in these will save time down the line removing rust and oiling them. It's just a case of keeping them sharp, which has to be done anyway. Hopefully you've been inspired to do your own renovation on these, I would love to hear your comments, good or bad. and feel free to post your own hand tool reno pictures on my Facebook page!